I've created two shaker cards today that are similar in concept & design, but look pretty different from each other. For the first one I've paired the new Flawless Diamond cutaway & Walter's Sparkly Shaker Selection with some previously released dies. I started with a turquoise A2 card base, then added a block of glittered paper to the middle. 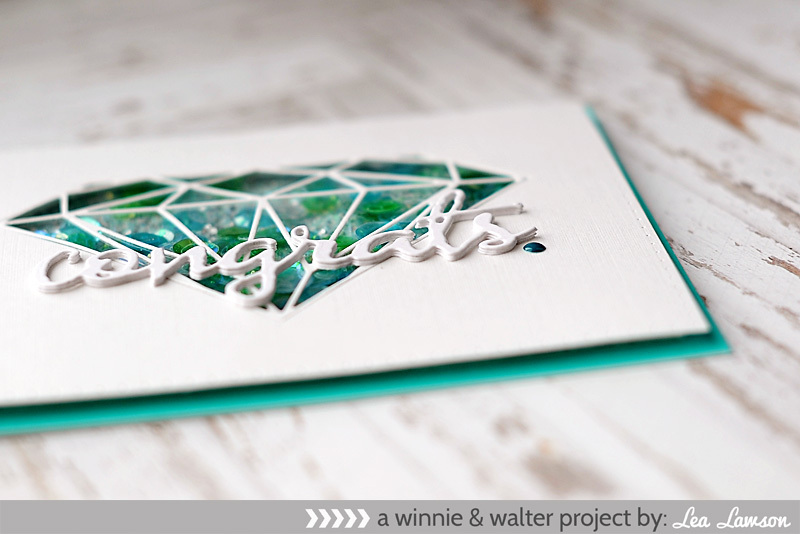 I diecut a white cardstock block, and then diecut the diamond from the middle of it. I left the diecut inlaid and just used a bit of washi tape to keep it in place until adding the transparency behind it. I poured some sequins to the middle of the card, then added the top layer using foam adhesive (make sure none of the sequins can escape!). 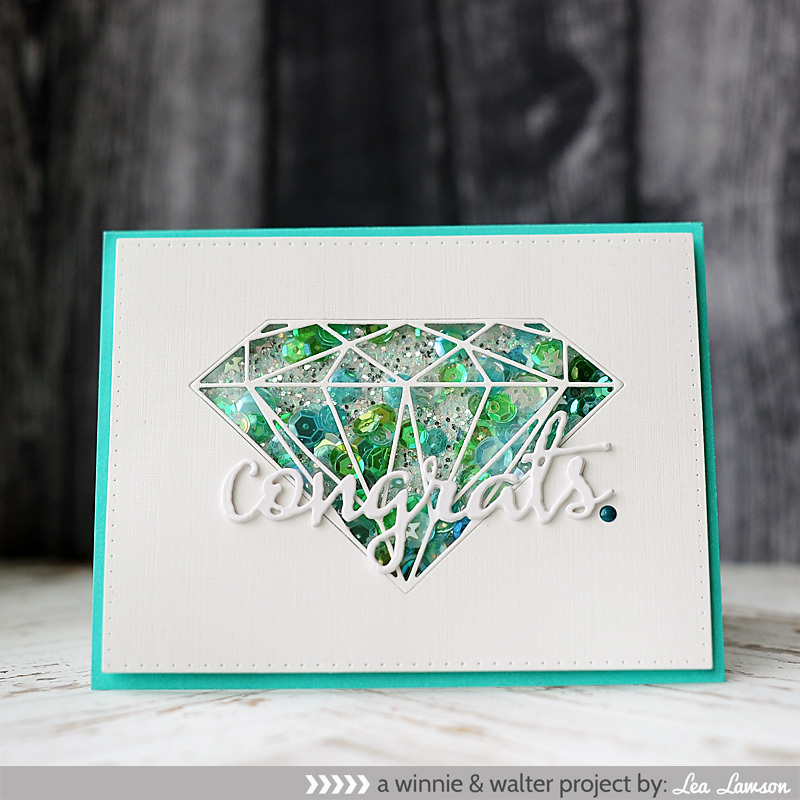 I diecut the word congrats 4 times from white cardstock, and layered to the diamond. I accented the end of the sentiment with an enamel dot to finish. I'm going to share my second card real quick, because while the colors & content are different...the directions are essentially the same! Just change up the card orientation, colors & sentiment word...and it is basically the same card! I love that even though the process is the same, the card is completely different from the first. 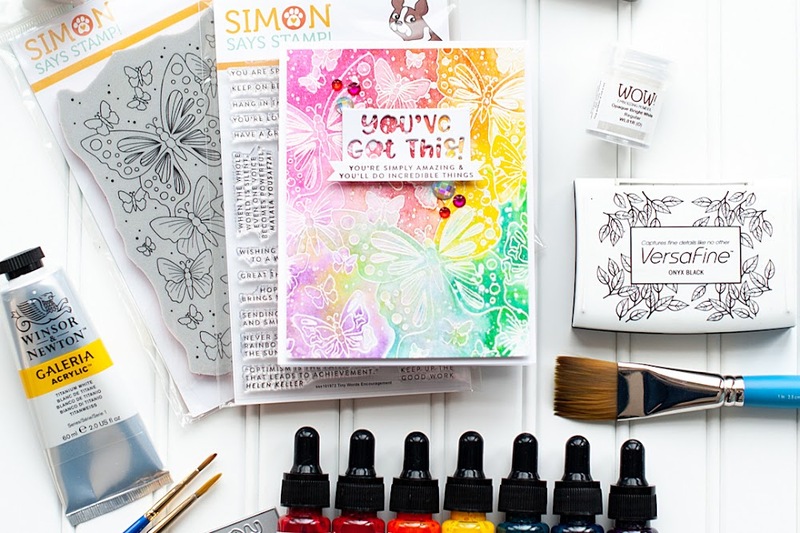 This is also an easy way to create multiple shaker cards at a time! Alright...some housekeeping stuff. Be sure to comment on all of the giveaway posts by 11:59pm tonight. They will be closed after that, and all winners will be posted by March 2nd. All of the new products will be available for purchase TONIGHT, so be sure to head on over to the Winnie & Walter store to pick up your must haves!!! 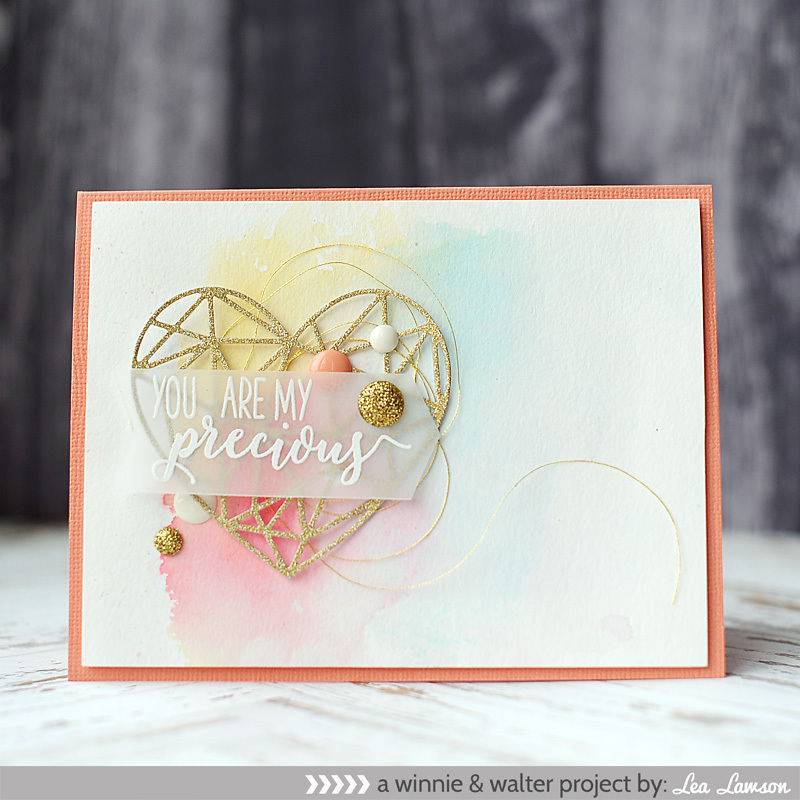 For my first card, I created the sentiment with the awesome "free with purchase" stamp set, Wishing You, and paired it with the new Pattern of the Rings Creative Screening that we introduced yesterday. I started with a black A2 card base. 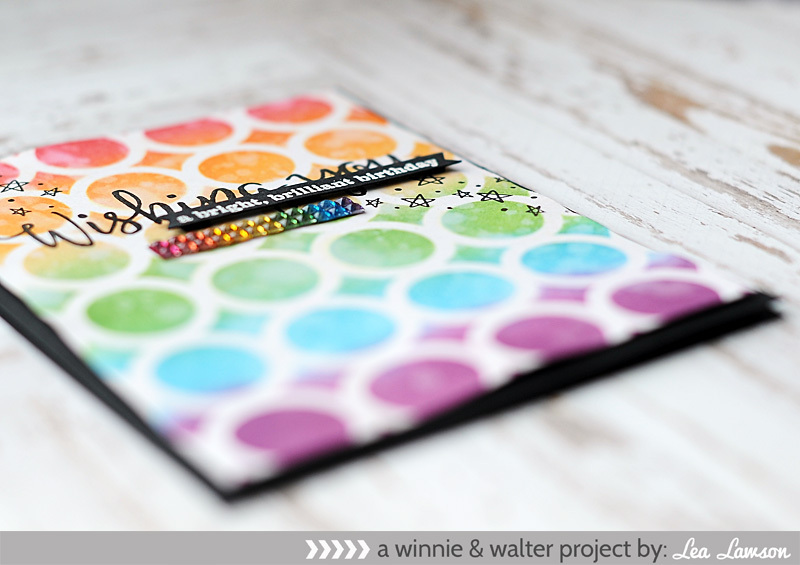 I inked a white cardstock block in a rainbow gradient using the creative screening & distress inks. I sprinkled some water to the inked background, then lifted it back up with a towel. 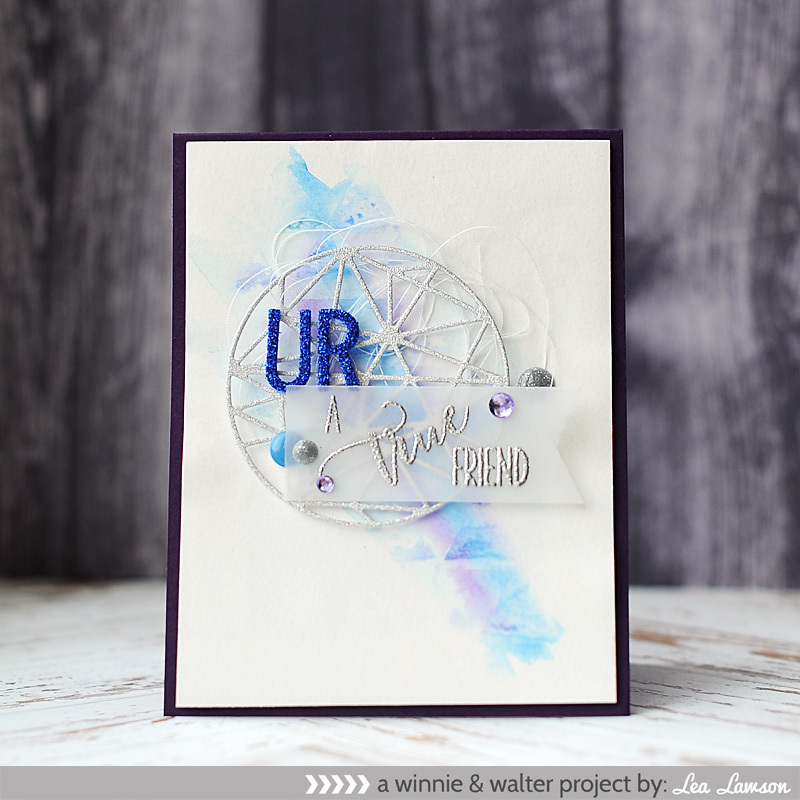 Once dry, I stamped the scripted "Wishing You" and stars to the inked background. Then I adhered it to the card base with foam tape. I stamped the rest of the sentiment to black cardstock, cut it into a thin strip & added banner edges to each end. 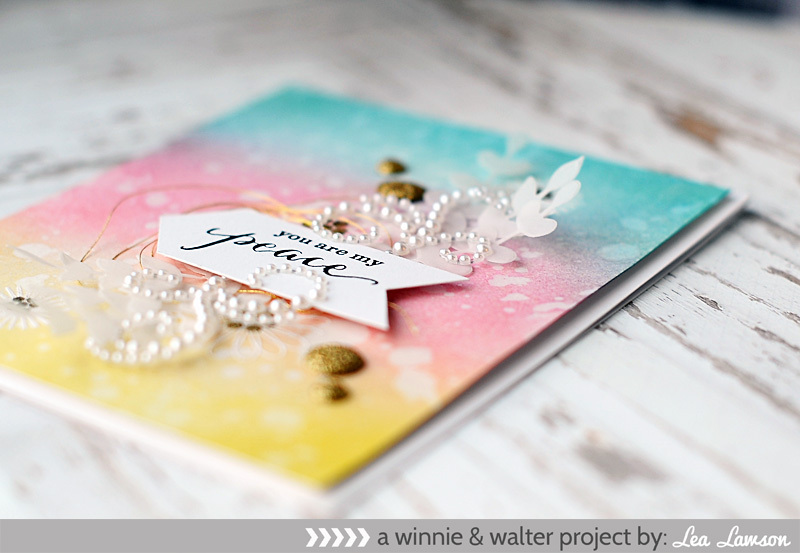 I adhered it to the card front with foam dots, and then accented with a strip of jewels to finish. For my next card I did a very similar design, except I used the True Multifaceted Border cutaways to create the background. 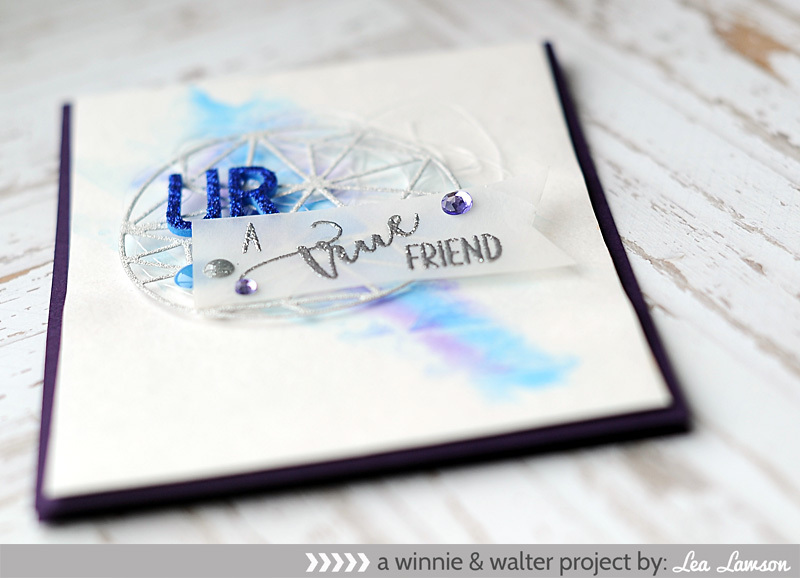 I used the same stamp set as above, and just used one of the different finishing sentiments. I started with a black A2 card base. I cut a block of white cardstock slightly smaller, and stamped the sentiment to it. 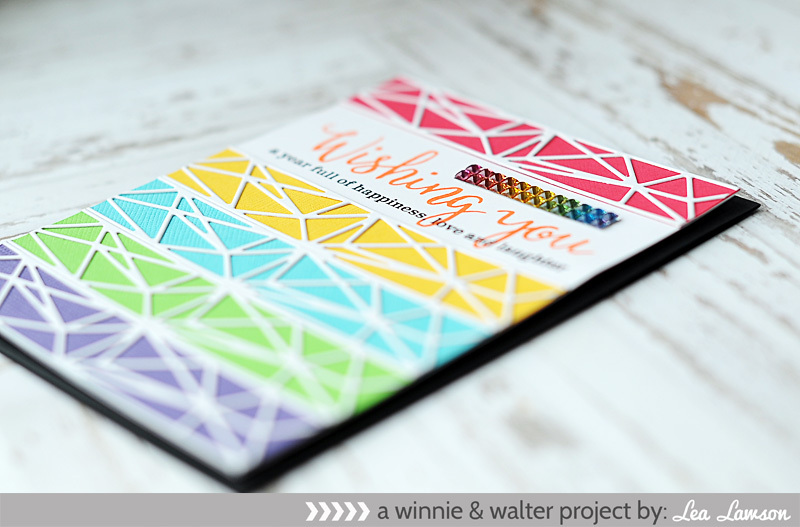 I diecut the multifaceted border top from white cardstock 5 times, and then the border bottom from rainbow colors. 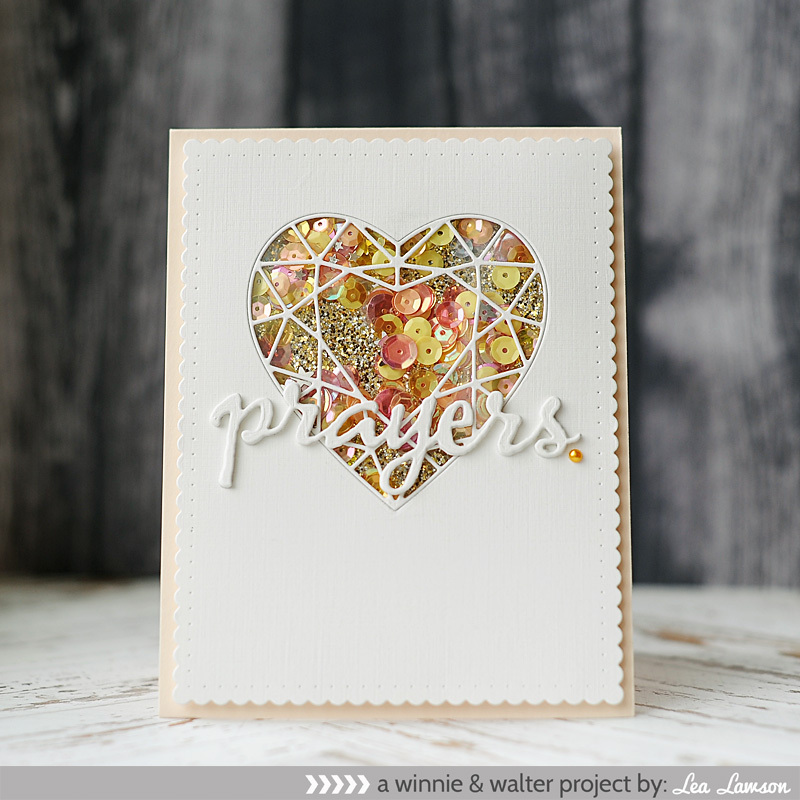 I layered them together, then layered them to the stamped white cardstock block. I adhered the block to the card base using foam tape, and then accented with a strip of jewels to finish. My final card is very different from the two above. It is still winter in my neck of woods, and the Scenery: Into the Woods stamp set was perfect for making this seasonal card. I paired it with the previously released Scenery: Big Bang Circle creative screening to create my wintry scene. 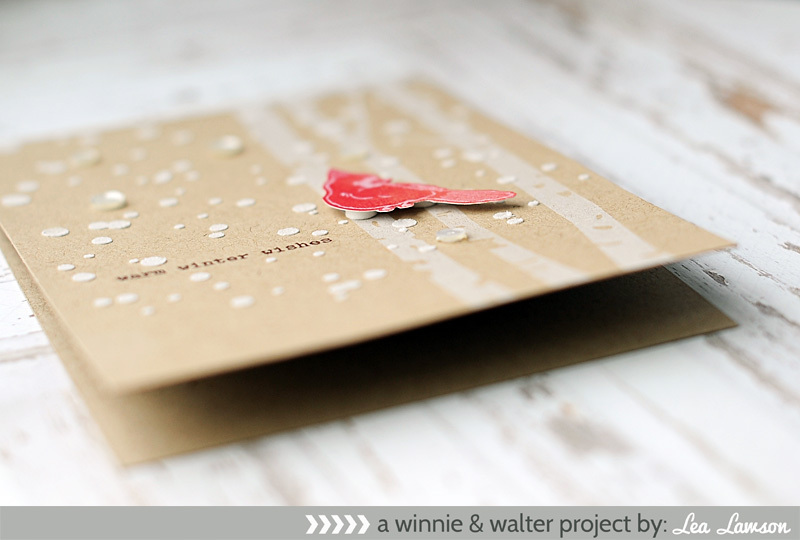 The sentiment is from the Comfort + Joy stamp set, and the cute little cardinal is from the Happiest of Holidays stamp set. I started with a kraft A2 card base. I stamped the trees in white pigment ink directly to the right side of the card using my MISTI. Then I applied white embossing paste using the Big Bang Circle creative screening over top of the trees & the rest of the card. Then I stamped the sentiment inside of some of the snowflakes using my MISTI. 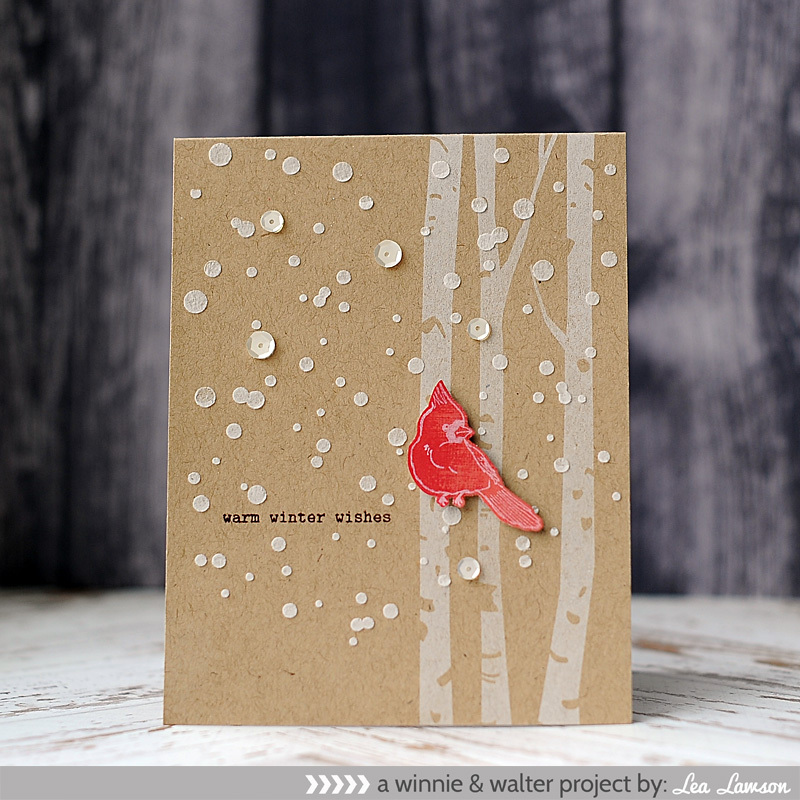 I stamped the bird to red patterned paper, cut it out & adhered it to the front with foam dots. 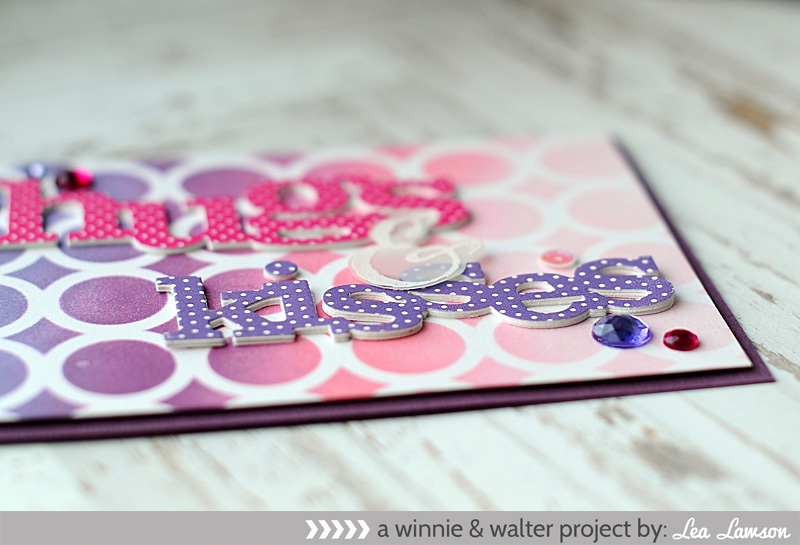 I accented the card front with white sequins to finish. Hi friends! 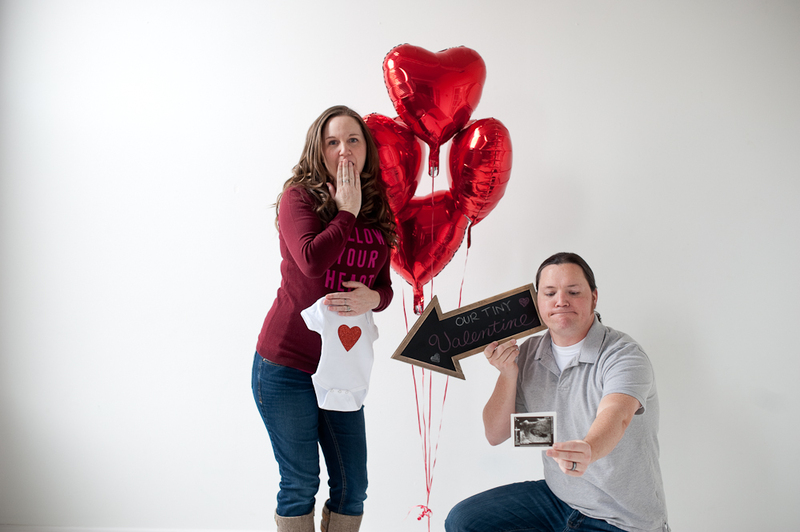 It's been super quiet around here since I made my exciting announcement on Valentine's day. One...I haven't felt super awesome the past couple weeks. 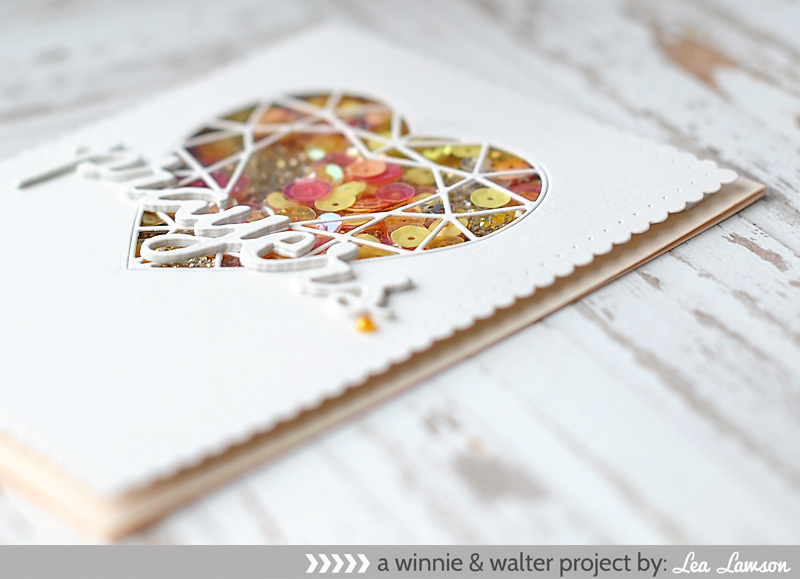 And two...I've been working hard on this month's new Winnie & Walter release! It's been a long while since I've felt able to participate in a release week, and starting back up is part of my healing process. 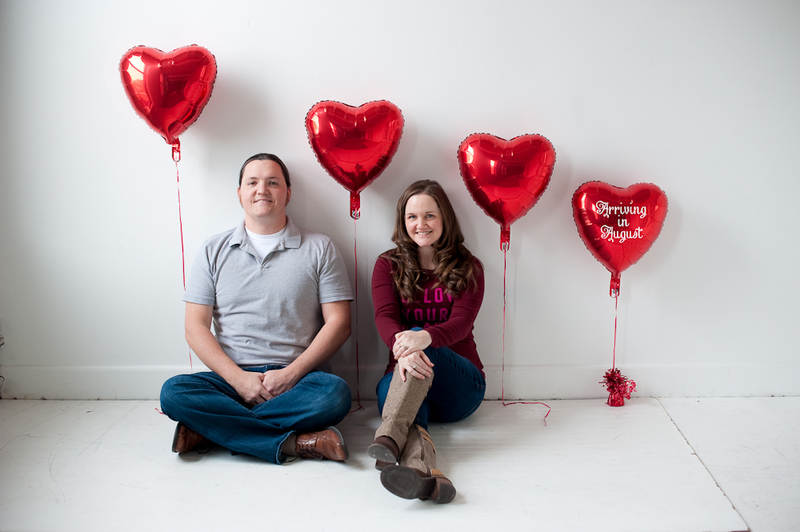 Before I get on with my post, I just wanted to thank everyone for the sweet & encouraging comments on our announcement. I know that many of you have continually prayed for me over the past year, and words could never accurately express my gratitude. For my first card I've combined the new Creative Screening with the new Kisses Cutaway. 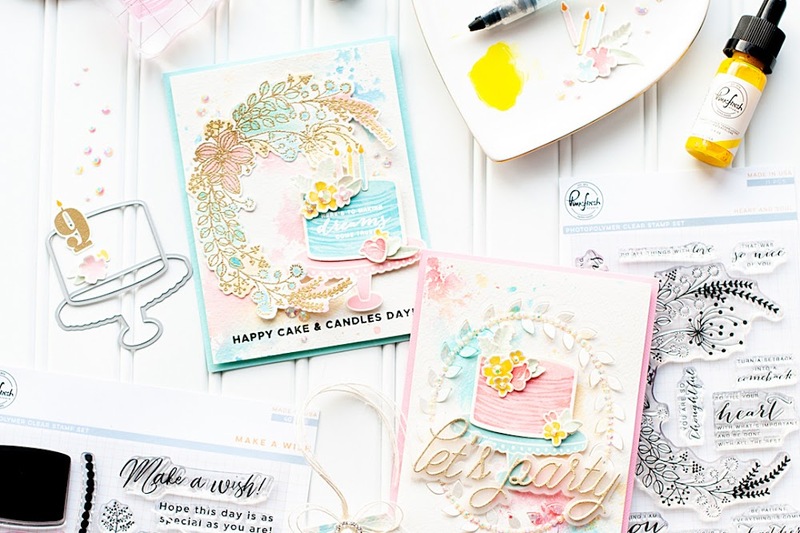 I paired them with the previously released In A Word: Hugs Cutaway, along with the ampersand from The Big, the Bold and the Merry stamp set. I started with an eggplant colored A2 card base. To create the screened background, I blended 4 shades of distress ink from purple to light pink. I adhered the inked background to the card base with foam tape. Next I diecut the words from matching dotted patterned papers, then cut each word from white cardstock a few more times. 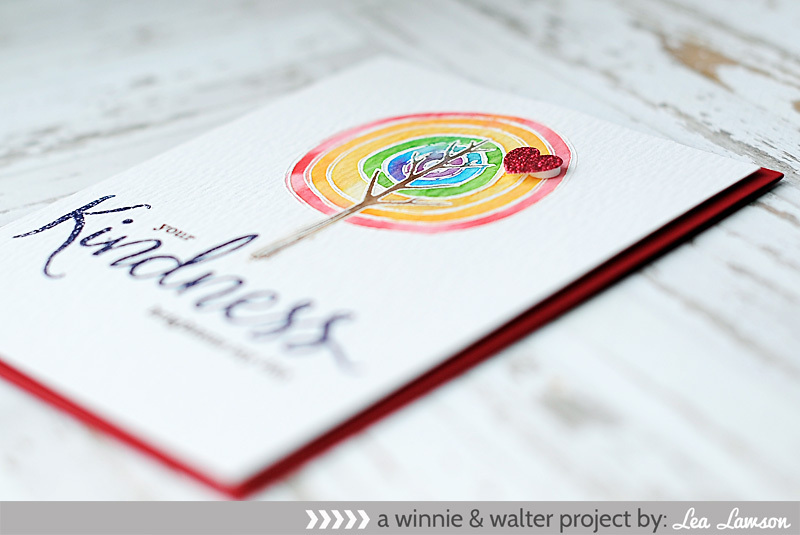 I layered them together to provide thickness & stability, and adhered them to the middle of the card. I stamped & heat embossed the ampersand to vellum, cut it out & added it to the top. I finished by accenting the card with jewels & sequins. For my second card, I combined the new In Bloom: Ava's Favorite Flowers stamp set, with a few previously released items. 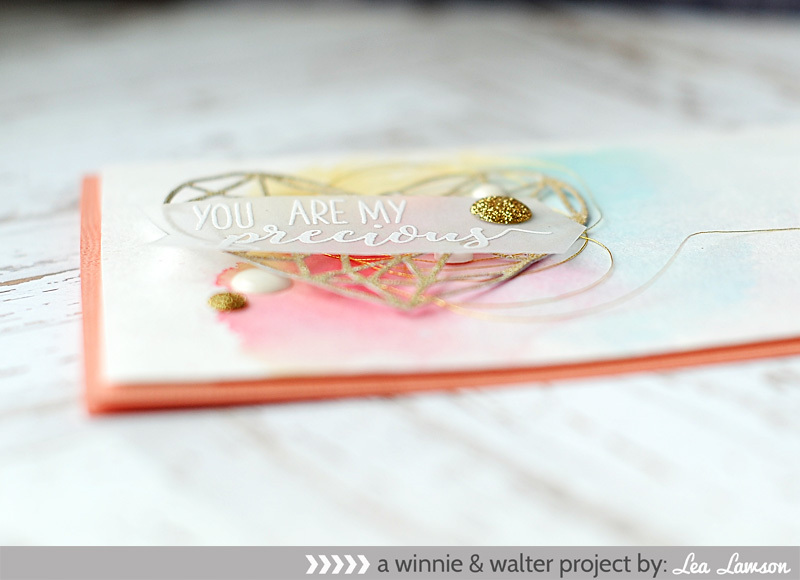 The sentiment was created from the Happiest of Holidays stamp set, and I love that you can create non-holiday themed sentiments with many of the Winnie & Walter seasonal stamp sets. 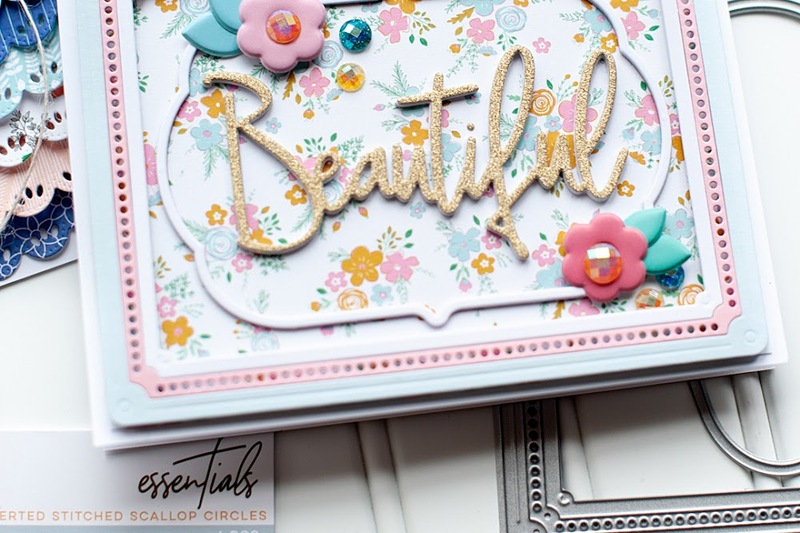 I also used the In Bloom: Paulina's Greenery Cutaways to help with my accenting. I started with a white A2 card base. 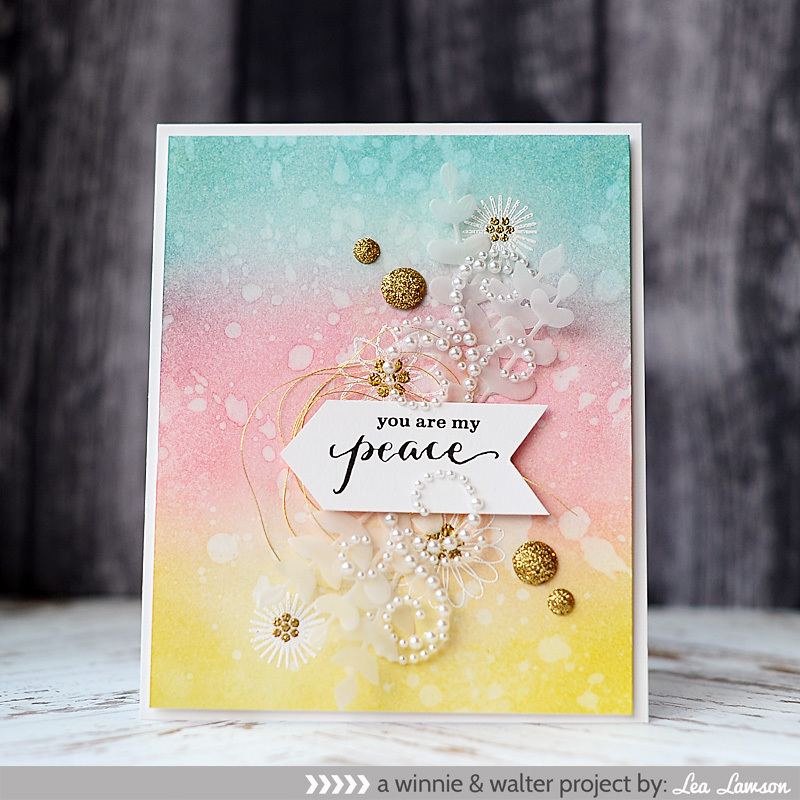 To create the background, I blended three shades of distress ink together in aqua, pink & yellow. I splattered the front with water, then picked it back up with a towel. I then stamped & heat embossed the flowers to the front. Once set, I adhered the inked background to the card base with foam tape. 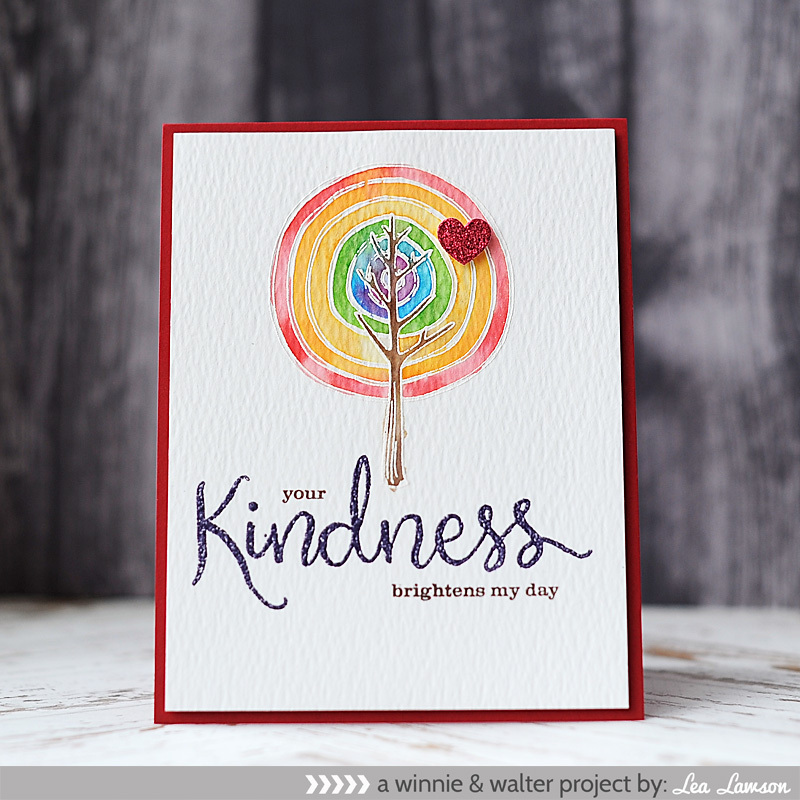 I stamped the sentiment to a strip of white cardstock, then cut it into an arrow shape. I adhered it over top a knot of gold thread with dimensional adhesive. I diecut the greenery multiple times from vellum, then adhered it around the sentiment banner along with pearl flourishes. To finish, I accented the front with gold dots. I took a pregnancy test when we woke up on Christmas morning. Within seconds (not minutes like the test instructs) it told me what I already knew...I am pregnant for the 3rd time. 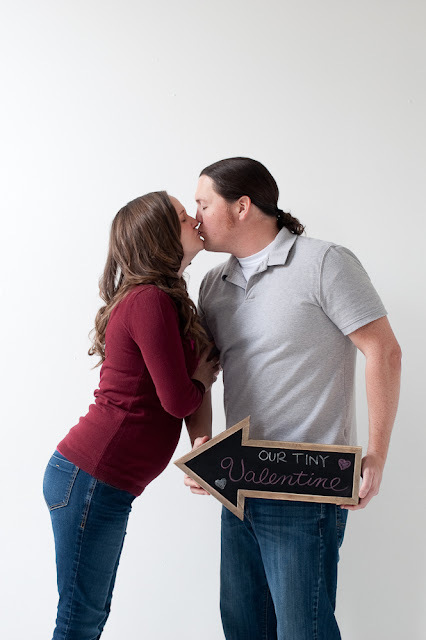 As of today I am almost 12 weeks along, and this little one is due to arrive around August 30, 2016. I've been showing since about 7 weeks along...and I am so sick of trying to "hide" being pregnant. The notion of a safe zone doesn't really mean anything to me anyways. This was not a surprise. After going through the ectopic I don't just get pregnant, so I require a little bit of help from my doctor. This was, however, quite the journey that I am still on. Right after Ellie died, I begged God to take my longing to have a child away. 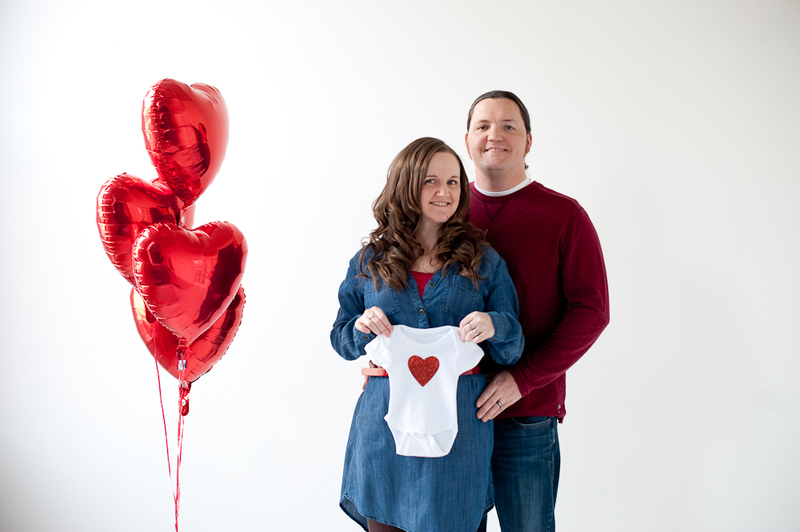 The thought of getting pregnant again physically sickened me, and the thought of it happening again was extremely overwhelming. That part...it's still overwhelming. And scary. Because the fact of the matter is that it is still possible. I have no promise or guarantee that this pregnancy will end any differently. Because they found nothing wrong with me that would have caused Ellie's issues, there are no precautions that can be taken to prevent them. My doctor has decided to separate the fact that I went into pre-term labor from Ellie's diagnosis, so there will be some things that get done from 16-36 weeks to try & stop that possibility from happening. Six months ago God didn't take my longing to start a family away from me. Instead, I had to struggle and fight and pray and claw my way to where I am at today. And that is a place where I can separate the death of Ellie from my view of pregnancy. I still struggle with her death. I wish it were different...but it's not. It's never going to be. But there are also realities that I've had to face about wanting to have a family that I can't wait on forever. I am not ashamed of becoming pregnant. I am excited and happy and thrilled...but I'm also apprehensive. I'm not apprehensive to love...that is an inane part of me. We saw this little one's heartbeat at our first ultrasound. I was 5 weeks, 6 days along. 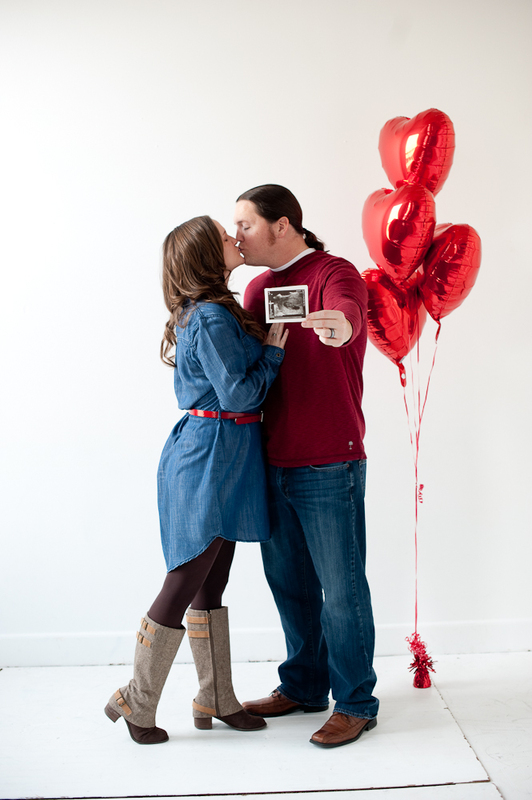 At a time when everything about pregnancy is still so uncertain & volatile...and we were able to see a heartbeat. No matter what happens...I love this little baby. I'm apprehensive of others. Of telling people our news. Not because I am ashamed or unhappy. But because I feel the need to protect myself from people. I feel the need to protect myself from unsolicited advice. Because no matter how well meaning the advice giver is trying to be...all it makes me feel is that they think I could have done something differently in my pregnancy with Ellie. That I somehow could have changed the outcome if I'd only done this or that. Let me state this right here & right now. I could not have eaten better. Or asked for more medical opinions. I did everything I could for Ellie. It just wasn't enough to overcome her diagnosis. For some reason that I will never know or understand....I wasn't allowed to keep her. Her life was meant to be spent in Heaven. So please, unless I ask for it, do not try to give me advice. Please don't allude to this one "working out" or being the baby I was meant to have. Because quite frankly, that insults the memory of my precious Arabella Grace. I've had to realize that our family will never be complete this side of Heaven. We could have a million biological, adopted or fostered children...but we will never be complete. A very precious, wanted & longed for baby girl will always be missing, and I get to deal with that reality every single day for the rest of my life. What can you do? Be happy for me. Pray for me. Pray for my heart as I continue to grieve my Ellie at the same time I anticipate the possibility of a new life. Pray for my well being & the baby's. And just be there with me. Notice that I said with, and not for. For indicates action...and I don't really need anything done FOR me. But you can be with me, side by side, as I encounter all the different thoughts, feelings & emotions that come along with being pregnant again after a very tragic loss. I know that is an uncomfortable place to be, but it is truly the best thing you can do for those that are grieving.